Synopsis: To Whom It May Concern is an epistolary play about transcendent and oft-kilter ways of love and internet relationships. When a 15- year-old boy writes a letter to a soldier and is confused for an older woman, a series of seductive exchanges begins, leading to an explosive encounter. *NOTE: This play contains adult situations and is not suitable for all audiences. All roles should be played by adults. Many of Squire's plays have received enthusiastic reviews and revivals, among them To Whom it May Concern, which ran off-Broadway in 2009, Match Me, produced by the New York International Fringe Festival in 2005. His writing has been called "a true gem that deserves to be set apart from the rest" by The Drama Review, "brilliant" and "thoroughly entertaining" by Show Business Weekly, and "engaging and provocative" by critic Martin Denton. His dark comedy To Whom It May Concern premiered at the Abingdon Theatre and won the Fresh Fruit Festival awards for best play and best playwright. 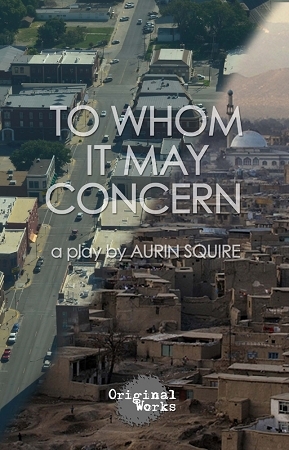 To Whom It May Concern was also produced off-Broadway in 2009 at the Arclight Theatre with a cast including: Israel Gutierrez, Matthew Alford, Nicholas Reilly, and Carmelo Ferro. In 2009, Squire wrote the book for the children's musical Matthew Takes Mannahatta, called "refreshingly clever" and a "cheerful tribute to our multiracial, multicultural America" by the New York Times. Squire has won several awards for his docudramas on Jewish issues, including Spanish Jewish families who fled the Inquisition and European Jewish immigrants who came to America. Dreams of Freedom won a Core 77 Design Award, NMAJ's Communication Award, and an AIGA Design Effectiveness Award. In 2013, Freefalling won the Fiat Lux Play Award from the Catholic Church. Squire is also a recipient of the Lila Acheson Wallace American Playwright Fellowship at The Juilliard School, and the two-time winner of the Le Comte du Nuoy Prize from Lincoln Center. In 2014 his work garnered first prize at InspiraTO Theatre's International Play Festival in Toronto and Lincoln Center's Act One Prize. In 2015 Squire received the Dramatists Guild of America playwriting fellowship, an artist in residence at the Brooklyn Arts Exchange, and a playwriting fellowship at National Black Theatre. He's also in the US Writers' Residency at Royal Court Theatre in London.